Machine tools, milling machines & CNC machining from PMT Corporation are the precision equipment components your company needs. Machine tools and milling machines require high volume & high accuracy to ensure efficient production. PMT Corporation maintains the highest quality control in the manufacturing of their machine tools and milling machines. CNC machining is the best way to ensure high volume in production. CNC machining of your machine tools and milling machines results in the volume and precision your company desires. The experts at PMT Corporation know what it takes to make your machine tools, milling machines and CNC machining meet the high demands of today's manufacturing companies. Machine tools, milling machines & CNC machining from all the top names in the business: Kiwa, Bugatti, Eurotech and Yamaseiki just to name a few. 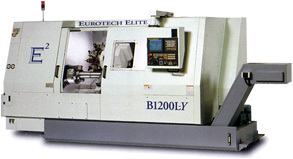 The machine tools and centers that we sell can handle the smallest operation to high volume milling centers. Does your company have special needs for your machine tools or milling machines? We specialize in custom machines that can turn any piece of metal into the perfect part matching the need of your company. Machine tooling centers not only turn out quality parts they do it faster and more efficiently to assure your company the highest return on investment. Talk to the experts at PMT Corporation. We know how to make the tools to meet your needs.